On the weekends however, service is deplorable. On Sundays, service frequency is cut back to once every 15 to 20 minutes, congestion and detours around Museum Campus and Grant Park delay buses up to half an hour each way, and 40 minute gaps in service form. This poor quality of service also lead to excessive overcrowding during off-peak times on both the 6 and the J14 routes. To live up to its brand, weekend service needs to be improved. Delays for all the south side express bus routes can be dramatically improved by implementing bus only lanes between Lakeshore Drive and 31st Street and Balbo and Michigan, at nearly zero cost in materials or vehicular capacity. Presently, Lake Shore Drive supports 4 lanes of free flow traffic northbound exiting to 6 lanes through traffic lights to the north1)For comparison, this 4 to 5 lane per direction section of Lake Shore Drive receives 25% to 50% less traffic than 3 lane per direction segments of the Eisenhower and Stevenson Expressways. If Lake Shore Drive were reduced to three general traffic lanes, it’s capacity would be slightly lower than that of the expressways.. The vehicular capacity of each lane is reduce by nearly half at the traffic lights, creating a bottleneck for which 3 free flow lanes have sufficient capacity to supply. The fourth lane south of McFeteridge Drive can be converted into a 2 mile long bus queue jump lane. The sole negative effect from lengthening the queue may be its increased probability of the end of the queue reaching State Street on I-55 where high-speed merging traffic combine with poor visibility. Increasing the sighting distances for drivers by removing the rightmost eastbound through lane or by redesigning this segment of highway is warranted2)The lanes in this segment of I-55 should be reconfigured anyways in order to reduce the amount of merging, weaving, and lane cutting that presently occurs.. North on Columbus, traffic generally flows freely except when the street is closed for summer festivals. During these festivals, temporary bus lanes could be implemented along the detour route using traffic cones as delimiters and enforcement by traffic marshals. Southbound, bus lanes could be added along the curbs of Balbo or Roosevelt and Columbus, and on the left lane of Lakeshore Drive. To make crossing over into the bus lane easier during festivals and Bears games, buses can access the bus lane by entering Lake Shore Drive at the light at Roosevelt instead of having merge left across 4 lanes of jammed traffic. Lakeshore Drive Traffic northbound before I-55 on a weekday morning. Every minute saved by these bus lanes would help nearly 29,300 CTA customers each weekday, 16,800 each Saturday, and 11,600 each Sunday, and numerous PACE express bus customers. 3)The summed ridership of routes 2, 6, 10, J14, and 26. Customers on the 28 are undercounted to compensate for overcounting on the 6 and J14..
Of course, these bus lanes, low off-peak frequencies, and slow travel times shouldn’t be required at all. There’s a 4 track electrified rail line serving the exact same routes faster and with intermediate stops, the Metra Electric line. This is one of the most underutilized rapid transit infrastructure in North America. Today, the Metra Electric is experiencing a decades long slow decline in ridership, with less than 10,000 boardings per day within the city4)Thank you Metra for updating the counts for the first time since 2006. The new summary tables and the detailed by-train data are very useful.. Most of the customers are peak period commuters to the loop. 23 trains are run during the peak hour, on a schedule that clumps service, giving no station outside the loop a frequency better than once every 15 minutes. Only one train every one or two hours runs midday and on Sunday. In addition to the higher fares charged by Metra, it’s no wonder is captures less than one quarter of this travel market. The CTA’s $23 million5)170,000 bus service hours at $135/hour. The actual cost per service hour is likely higher than the CTA average due to the use of 60 foot articulated buses and higher average speed. Both factors increase maintenance and fuel costs. per year duplication of service is necessary as long as the Metra and CTA use separate fare structures and Metra restricts off-peak frequency. Back to bus tracker data. During peak periods, the J14 isn’t only delayed by congestion near the Museum Campus, but also at the Science Drive and 57th Drive. As noted in my previous post, the removal of the light at Science Drive and optimizing the signal timing at 57th should reduce this bottleneck if Cornell Drive were to be removed. The 6 Jackson Park Express experiences similar delays as the J14 on Lakeshore Drive and in the loop. It also experiences unnecessary delays on the local portion of the route. Through Hyde Park, stops are ill designed for 60 foot buses and the stopping pattern is too frequent. Stops that aren’t at intersections such as 5200 and 5440 S. Hyde Park Blvd, and stops within 300 feet of other stops at Cornell Ave, and 4800 S. Lake Park could easily be consolidated to bring stop spacing in line with the CTA’s service standards of a stop every 660 to 1320 feet. At 67th and Stony Island in particular, the 6 is almost always delayed. There are three signalized intersections in a row that the 6 must navigate: SB Cornell Drive, Marquette, and 67th Street. After visiting the site, I found that both the placement of bus stops near side at the start of this combination and the signal timing cause the 6 to wait for several 90 second signal cycles before proceeding. In both directions, the signals are designed to queue vehicles before giving a green wave through the lights for cars on Cornell Drive and Stony Island. These queues have to clear before the 6 can approach the nearside stop, wasting a green cycle for the bus. 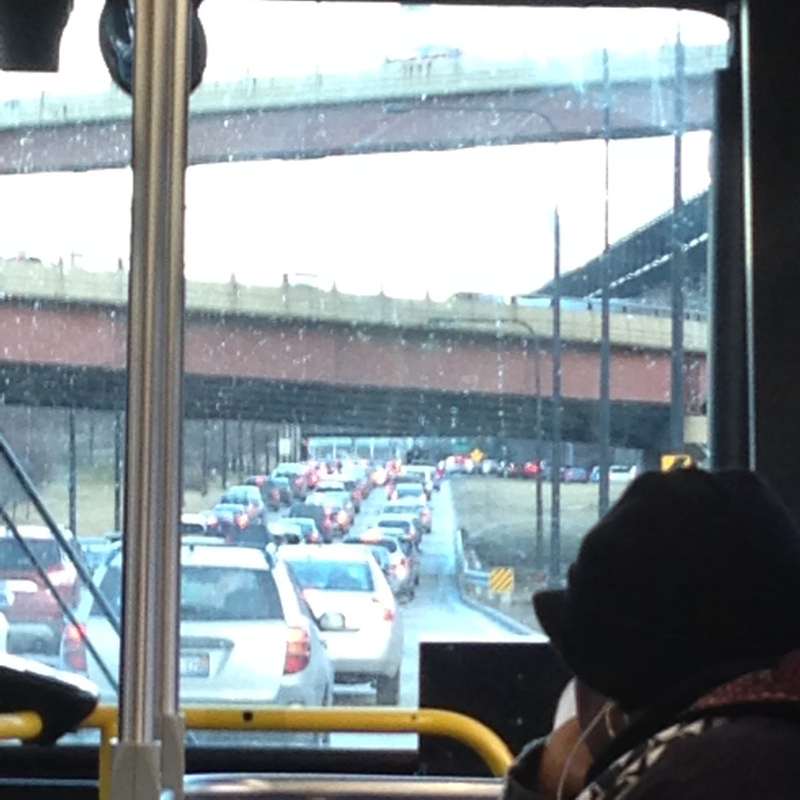 Southbound, the bus then has to cross two lanes of this queue in order to reach the left turn lane. The bus barely misses the left turn cycle and has to wait a full 90 seconds. A simple bus stop relocation to the far side of the first light both northbound and southbound may save several minutes for each run of the 6. The long cycle times, near side bus stops, and automotive oriented green waves along Stony Island also severely affect reliability of route 28. During overnight and low demand periods, the 28 maintains a very high average speed along its route, but the average trip takes consistently 50% longer mid-day. When a bus falls behind schedule, it can miss the green wave several times consecutively while the bus behind catches up, leading to rapid bunching. On weekends, the bus schedule does not sufficiently allow for the additional travel time from missing the green wave, and buses are unable to recover at the ends of their routes. The 28 also wastes approximately 3 minutes on weekdays in traveling over a mile at the end of every trip looping around Olive Harvey College. This distance could be shortened to 800 feet through the construction of a bus only driveway between Stony Island Ave and the campus parking lot. These 3 minutes add up to an approximate $130,000 operating cost savings per year, and 7,000 customer hours saved per year, far more than the cost of 300 lane-feet of asphalt and periodic enforcement of the bus-only restriction. 1. ↑ For comparison, this 4 to 5 lane per direction section of Lake Shore Drive receives 25% to 50% less traffic than 3 lane per direction segments of the Eisenhower and Stevenson Expressways. If Lake Shore Drive were reduced to three general traffic lanes, it’s capacity would be slightly lower than that of the expressways. 2. ↑ The lanes in this segment of I-55 should be reconfigured anyways in order to reduce the amount of merging, weaving, and lane cutting that presently occurs. 3. ↑ The summed ridership of routes 2, 6, 10, J14, and 26. Customers on the 28 are undercounted to compensate for overcounting on the 6 and J14. 4. ↑ Thank you Metra for updating the counts for the first time since 2006. The new summary tables and the detailed by-train data are very useful. 5. ↑ 170,000 bus service hours at $135/hour. The actual cost per service hour is likely higher than the CTA average due to the use of 60 foot articulated buses and higher average speed. Both factors increase maintenance and fuel costs. Excellent analysis. Will you write an executive summary, print it on letterhead, and mail it to all aldermen through whose wards the routes pass, as well as to the CDOT commissioner? I have a lot of confidence – due to the nature of the positions they hire – that the CTA knows some or all of this already. But there’s one organization, CDOT, that has final say – and different staff – of where bus stops can be. Lake Shore Drive adds another layer of bureaucracy: IDOT. I should start writing more letters (I did send a letter to the editor last week). Beyond local elections this week, the most important audience for this type of information right now is Gov. Rauner, his advisors, and his political opposition. The CTA is proposed to take a 7% operational budget cost, on top of the cuts imposed in 08/09 when sales tax revenue dropped. As can be seen here with route 28, the CTA cannot afford to add another bus midday on Sundays and instead uses up management resources to constantly short turn buses while still providing unreliable service and giving few breaks to drivers. While Chicago’s transit could run more efficiently, it cannot do so without the cooperation of the state. The governor has the power to push for reform in how our streets are allocated. Bus optimized signal timing on state routes, queue jump lanes, and especially Lake Shore Drive bus lanes (north and south) can all be implemented by executive order. Even more importantly, Rauner can push for reforming Metra’s work rules and seek an FRA exception for the Metra Electric. While I’d like to see the operational savings from these reforms invested back into transit, they can also be used to reduce the budget while maintaining existing service levels. None of these efficiencies are within the CTA’s power to implement. A shift in state policy is required to make it happen. WOW — Thank you fb, I did not know these things; I will be getting in touch with the Governor’s office soon, you may have just given me the ammunition I need to get these trains running. And now we have former FRA Chief Joe Szabo here at CMAP. Did you know the Gray Line is included in CMAP’s RTP (ID# 01-02-9003 – “CTA Gray Line ‘L’ Route Project”), and it is obviously (the trains are running) most Shovel-ready, and EIS-ready Major Capital Project in the entire U.S of A.! And I believe it is the only MCP in the country submitted by, and accepted from a Private Citizen.